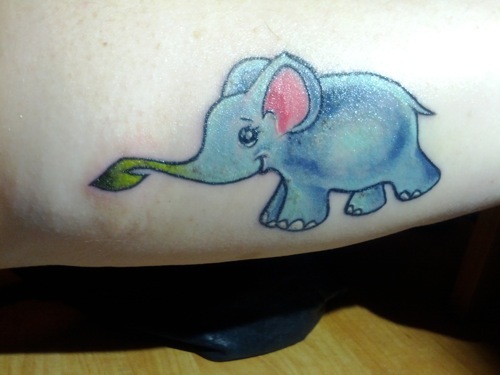 A few weeks ago I posted a story of a fan, Lindsey, who had just gotten a Herbie tattoo. Then I started talking to Sarah, who also wanted to get a Herbie tattoo. After emailing with you I was the one that was honored that it was ok for me to get Herbie for my tattoo. Your such an inspiring and encouraging person and I am so glad that I have gotten the privilege of being able to get to know you in your books, HHC and EHH, and also on facebook. I just got Herbie tattooed on Friday the 3rd of Feb so he's still healing up a little bit. I read about a person named Lindsey also in one of your blogs and also saw her tattoo of him, and read her story. I can really relate to how she felt, I too had tried several times and gave up, whether it was thinking it was to expensive, or just letting temptation get the best of me because I wasn't sure I could learn how to cook different things, or going out anywhere with family would be to hard to eat. This last time I tried it finally worked for me, I was sent to a dietitian when going for a doctors checkup and she ended up being vegan, and had started helping me to learn and understand more of eating plant-based. I was able to go to a few meetings and see others who were also vegetarian or vegan. She was transferred to another office and I wasn't able to go to her again for questions or help, and around this time is when I started to hear about you. I started reading your blogs and website and I believe that things were meant to be and I knew I could continue on my journey to become vegan and succeed this time. I feltso good this weekend being to show Herbie to everyone and being proud to explain to them what this tattoo meant to me and how special of a person you were in how you are helping everyone and encouraging us all the time. We also went out to eat and as I was ordering I was looking down at him on my arm and he kind of feels like my little cheerleader with his little plant on his trunk letting me know I can do this. I am also in our local newspaper for a contest against 14 others to lighten up in 2012. I am the only Vegan and was proud to tell them that I was, and if just one person asks about what Herbie stands for, or about your book that I talked about in my blog for the newspaper that will be one more person that with everyone together as a team we may help to get healthy and live longer. Thank you for everything that you share with all of us. Its an honor and a blessing for me to have met you. Thank you Sarah! I'm so happy you like your tattoo & good luck in the newspaper contest!